You know, what’s more grueling, tedious and tiresome than gathering all your year-long financial information to jot it down on your annual tax return? It’s figuring out where in the world to actually enter all the information. Though not a rocket science but still, filing a tax return is not kids play. With all the accounting and tax-related jargon pounded by Uncle Sam really makes it a boring activity and a necessary evil that you have to deal with year after year. Even when you have no earnings to report. So I thought, why not relieve you of this misery to a little extent? In this series of articles, I’ll be explaining about different US tax forms. What purpose does each and every tax form serve and when and how is that form is required to be filled. So the very first form that I’d discuss today is the Schedule E. Though, there’s another brief article which discusses why this form is even needed. Similarly, there’s another tax form known as the Schedule C which is quite similar to Schedule E and whether to complete Schedule C or E sometimes boils down to a minor factor such as if the income earned was from an active or supplemental business. So make sure that you read the article about Schedule C to understand the difference. 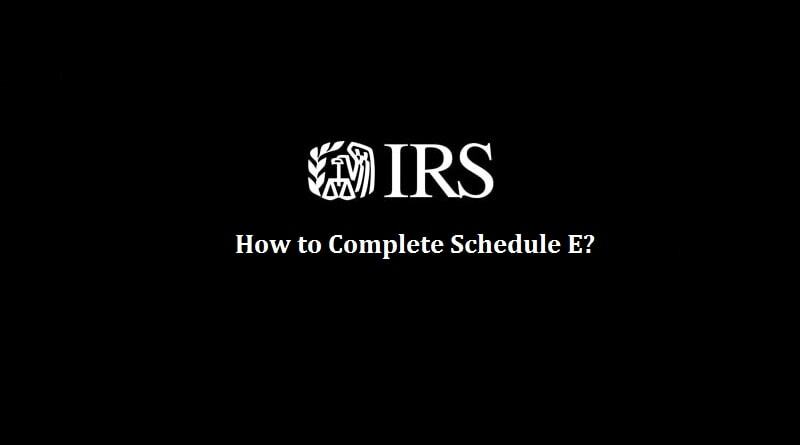 This article will discuss the details of Schedule E into sufficient length in order to get you along with this tax form. Schedule E, also known as the Supplemental Income and Loss form is a tax form to report your passive income from real estate rental activities, royalties, investment in other businesses etc. on your individual Federal Tax Return, 1040. Additionally, any income you earn from your hobby or past-time activity should also be reported on Schedule E.
Who is Required to File Schedule E? 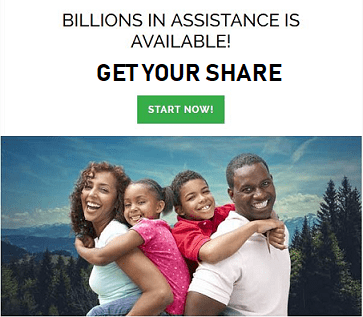 Supplemental income is the form of income one generates without significantly working for it. 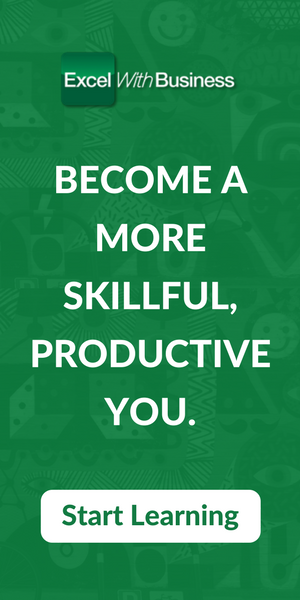 Or in other words, if you generate income from sources other than your main source of income. So a real estate agent who earns income by buying real estate properties and renting them out does not have to file Schedule E but say, a banker (whose main income comes in the form of the bank’s salary) who invested in an apartment and rented it out does need to report his rental income on Schedule E.
When do you File Schedule E? Of course, with the annual individual tax return, also known as 1040, you’re required to file the Schedule E to report your income coming from the real estate rental activities, royalties, investment returns from the S corporations or partnerships etc. Again, you only need to file all of the above earnings in the Schedule E if the earnings from the above sources are supplemental in nature. I believe I don’t need to go through what supplemental income really is. Right? How to Complete Schedule E? After clearing the What, Who and the When, let’s talk about something more important. The reason why I decided to write this article in the first place and that’s how do you fill in all the necessary fields of the Schedule E and file it along with your annual Federal Tax Return for Individuals (1040). Before starting, let’s have a good look at the form and gain an idea that how the Schedule E actually looks like. The page 1 is entirely dedicated to the part 1: Income/Loss from Rental Real Estate and Royalties and the second page to the rest of the sources. While I won’t commit the mistake of explaining how each and every part is supposed to be filled, as a single article won’t do them justice (and it will be a bit tardy as well). I believe that each part deserves its own article. However, just to give you an idea, I’d definitely explain how to fill the part 1 of Schedule E. The purpose of this is to give you an idea how the information flows from one form to another. The first thing to clarify is that if you have a look at this part, you may notice that you can enter information of up to 3 real estates on the form. So what to do if you have more than 3 properties? Well, in that case, you can file another Schedule E. So in the multiples of 3, you can use as many Schedule E as required. For e.g. In case you need to report income/loss of 9 real estates, then you’re required to file 3 Schedule E forms. 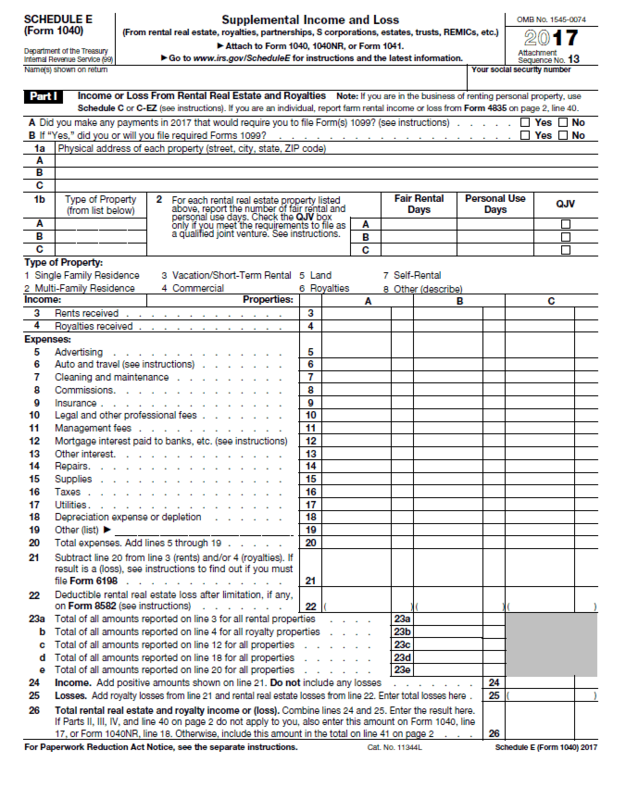 In case of 10 real estate properties, you will be required to file 4 Schedule E forms. 3 Schedule E forms for the 9 properties and 1 extra for the tenth. Without going much into the details, let’s explore different rows of part 1 of the Schedule E.
These further divide into sub-rows. Enter the address of your rental properties in rows 1a. You can add up to 3 different addresses. Enter the number of days the property was rented out for. Additionally, if you personally used the rental property, indicate it in the “Personal Use Days” section of the row. 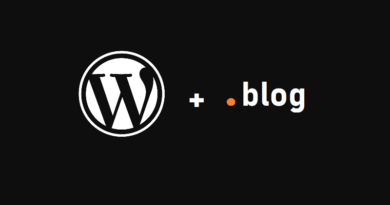 Enter the total amount of rent/royalties received from your properties. In case of there being more than one rental properties, you need to notify the income separately for each property. Include the relevant expenses incurred for each property over the course in the rows from 5 to 19. Note that on row 19, you can add those expenses which you think are not mentioned in the rows 5 to 18. Just add up all these expenses and write down the total in row 19. Subtract total expenses from the income and enter the difference in row 21. 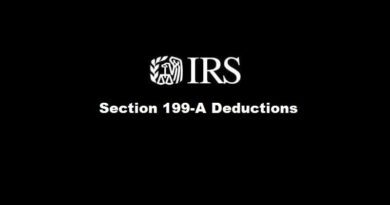 If the difference is less than zero, in addition to mentioning it on row 21, you may also need to file form 6198 – At-Risk Limitations. This form requires its own article so I won’t discuss the details here. However, you can see this link for more information. If a bottom line is a net income, enter it in row 24. However, if it’s a loss, enter it in row 25. It’s quite a possibility that there could be both, an income from one property and a loss from another. In that case, both lines will be filled accordingly. In case you have more than one Schedule E, you are required to fill lines 23 to 26 (mentioned below) only once. So you need to enter the total of all your rental properties in these lines. I hope I’m not confusing you. Sum up all your income and losses and enter the result on line 26. Once you have filled the Schedule E till the line number 26, how to move forward from here depends on whether any or all of the parts 2, 3, 4 and 5 apply to you. However, if the answer is yes, then fill in the relevant part accordingly, sum them up in line 41 on page 2. 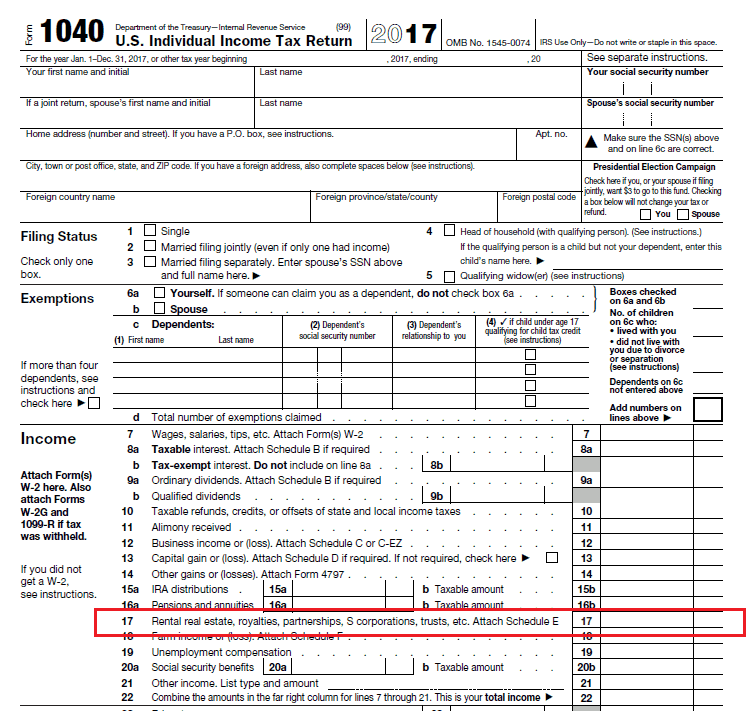 Eventually, from the line 41, transfer the amount to the line 17 of form 1040. So this is how you fill Schedule E. Due to certain limitations, I have not completed this form in its entirety, however, I believe that it will still be enough to get you along with this tax form. In case you have questions about Schedule E that you feel have remained unanswered, just let me know in the comments section. I’d definitely try my best to answer them. 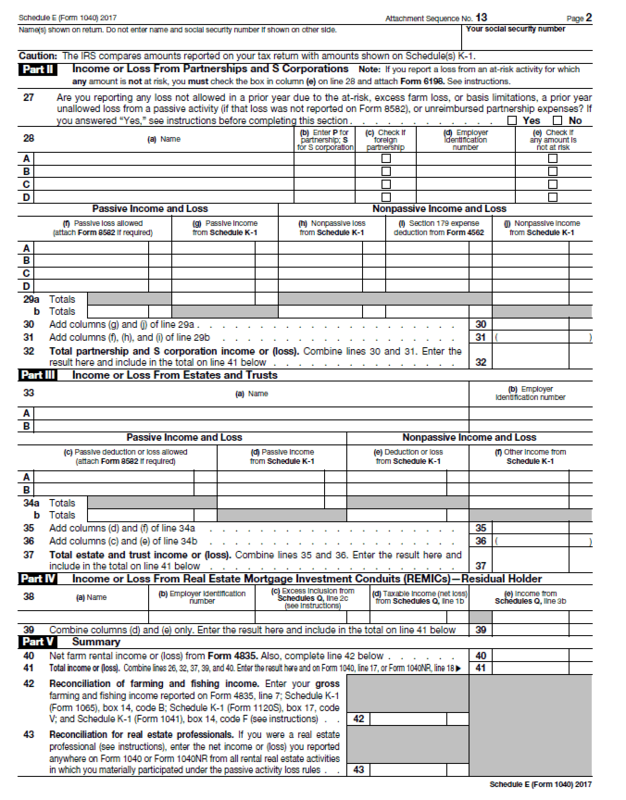 ← Schedule C Form 1040 – How to Complete it?